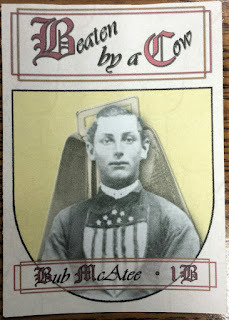 Some time ago, I posted an early draft of my first true set of custom cards, which came about as the result of considerable boredom, a sudden rash of interest in 19th century baseball and a Photoshop update. The subject matter I chose was an era of my favorite team which is not widely discussed, despite the focus on age and history with the Chicago franchise: the 1871 Chicago White Stockings. Now, I haven't swapped sides and started rooting for the Southside baseball club; the Cubs were originally known as the White Stockings through the 1880's. In fact, when Charlie Comiskey was settling on a name for his new AL club in 1902, he deliberately chose the name "White Stockings" (later shortened to Sox) in order to evoke the great teams from his youth spent in Chicago. Last time I showed these off, they lacked backs. Now, this wouldn't be a huge problem for a set of customs revolving around players of today or recent history. However, since I can pretty much guarantee that no one has heard of or thought about these guys in many decades, a little bit of a biography is essential. Without any further ado, allow me to present to you the informative backs that I've completed for this set. Perhaps you'll find this long-forgotten era to be quite fascinating or maybe you'll be bored to tears and feel like you're back in 12th grade history class; either way, I had way too much fun typing them up. Now, if you read all that, you absolutely rock and we're probably kindred spirits. If you didn't, I can't say that I blame you - that is A LOT of text. I dug this tome up at my local library many moons ago and I must have re-checked it out and read it cover to cover 3 or 4 times by now. This is what happens when you're a history nerd and a rabid Cubs fan. If you consider yourself a die-hard fan of the Northside baseball club or generally find the earliest and rowdiest days of baseball history to be fascinating, this title is essential reading. It's the only adequate published book I can find that covers this time in Chicago baseball with any detail. This may have something to do with the fact that a great majority of the records from this time went up in flames in the aforementioned Great Fire. Furthermore, this test was run before I'd completed the backs; thus, now I've got to figure out the alignment for those. Overall though, I'm rather satisfied with the result - I just have to get my hands on some thicker card-stock so that they don't bow quite so much. When I strike it rich and these cards are being mass produced all over North America, that "proof" card above is going to be worth thousands - muhuhahaha! *ahem* Anywho, please don't be afraid to leave any thoughts about the write-ups on the back or the design on the front. I'm always looking for constructive criticism (or effusive praise, I'll take that too, I guess). That is why I'm posting these to the internet, after all. I hope there's at least one person out there reading who finds these at least half as interesting as I do! Hey, I bought that book about 10 years ago off of Amazon for like $4. It's a pretty good read (I've only read it once). It's kind of neat to see it on someone's blog, although I guess if it was going to be on a blog, this would be the one. By the way, the customs look really good. 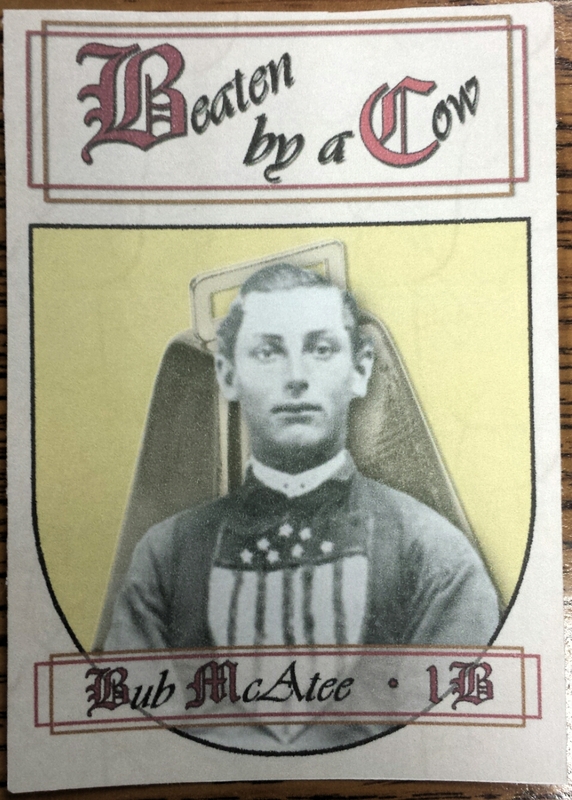 I especially like the placement of everything on the back (text, card number, name, etc.). Those look great. Man, you do fantastic work. Upper Deck, Panini, Topps pay attention. This is how you do a card right. I was just introduced to Jonathan Coulton today by one of my students and now it's on your blog? What shenanigans are these?